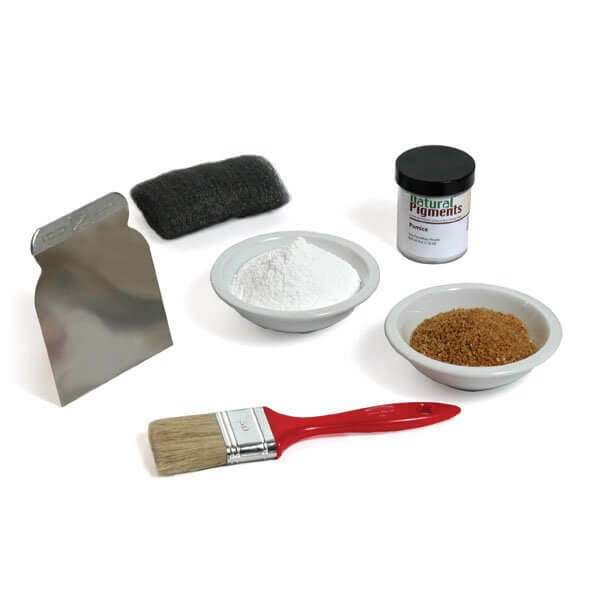 The Natural Pigments Gilding Gesso Kit has everything needed to apply gesso to panels, frames, furniture, etc., as a base for gilding. "Gesso Oro per Indoratori" brand is the preferred gesso by professional gilders and painters in Europe as the choice base for their gilding and painting projects. We highly recommend that you purchase the book, Practical Gilding, as a useful addition to this kit. Practical Gilding is a comprehensive introduction to oil and water based gilding, the procedures used and the materials required. Very helpful for beginners, but also excellent for problem solving by experienced gilders. Covers in-depth every aspect of gilding, with chapters on materials, surface preparation, oil gilding, gesso, water gilding and special techniques. Effectively illustrated with concise drawings. This book sets down detailed descriptions and explanations of the traditional methods of both oil and water based gilding in a way that can be followed by another craftsman. Like any skill, gilding requires practice, but if the well-tried methods are followed, and the would-be gilder is prepared to use more leaf than the professional, he or she should be able to produce satisfactory results.